Martha Bourdo Maurer of Otsego passed away Sunday, January 5, 2014 at her home. Martha was born May 3, 1920 in Toledo, OH, the daughter of Jesse and Sarah ‘Mattie’ (Mohler) Shoemaker. She was a 1939 graduate of Martin High School. 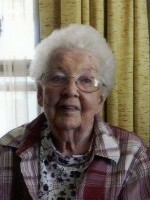 She enjoyed golfing, bowling, crocheting and traveling. She had been a lifelong member of St. Francis Episcopal church in Orangeville. On October 3, 1942, she married Lawrence Bourdo, who passed away in 1976. Martha was a great cook and had farmed with Lawrence following his time in the service. In 1965, they bought a restaurant in Homer, which they operated until his death. On May 4, 1980, she married Edwin Maurer and they spent 16 years wintering in Florida. Edwin passed away in 2002. Surviving are 3 daughters, Charlene (Jack) Kubizna of Kalamazoo, Kathleen (Steve) Macomber of Otsego, Colleen (Jim) Vorwald of Otsego;2 step-sons, Brent (Cathy) Maurer of Gun Lake, MI, Jack (Pat) Maurer of Clare, MI; 10 grandchildren, Kristina, Michael and Kenneth Macomber, Larry and David Kubizna, Donald, David, Troy and Chad Maurer, Lisa Maurer Thayer; several great-grandchildren, nieces and nephews. Also preceding her in death were a step-son, Gary Maurer and 2 brothers, George and Jim Shoemaker. Cremation has taken place and a memorial service at St. Francis Episcopal Church will be announced. Interment will be at Oakhill Cemetery, Orangeville. Memorial contributions may be made to Wings of Hope Hospice or St. Francis Episcopal Church.